We’re here to help. Find answers to our most frequently asked questions. 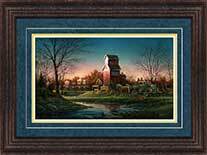 If you own a store, you may qualify to become a retailer of Terry Redlin's fine art prints and merchandise. Please visit our dealer inquiries page to learn more. Didn’t find what you were looking for? Call the Redlin Art Center during business hours or send us a message through the contact form. We package every item with the utmost care. Learn more about our shipping rates, expected arrival times, and more. If you have a problem with your order, we want to make it right. Here’s what you can do if something didn’t arrive as expected. If you’ve purchased a Terry Redlin print, you’ll want to keep it in good condition. Here’s what you need to know about caring for and appraising your print. Need to return or exchange an item from the Redlin Gift Shop or official online store? Learn about our return policies and procedures. Industry art terms can be confusing, but we like to keep it as simple as possible at the Redlin Art Center. Here’s what you need to know if you’re purchasing a print.